The College provides high quality instruction, maintains a high standard of academic performance in the classroom, and endeavors to maximize student learning. Students whose performance does not meet the College standards will be required to improve their performance or be dismissed. The College assumes students to be mature and responsible, and students are expected to fully apply themselves in academic endeavors. Furthermore, the College expects students to have knowledge of the information and policies presented in this Catalog and other College publications. It is students’ responsibility to be aware of individual academic standing at all times, and to maintain satisfactory progress toward completion of the program requirements for the curricular program in which they are enrolled. During the semester, if a student is uncertain of academic standing in a course, or realizes standing is unsatisfactory, the student should request a conference with the instructor(s) concerned. During such conferences, the instructor informs the student of the quality of individual work and seeks to help the student improve academically. Information about services to help assure student success is available in the College Services section of this catalog. 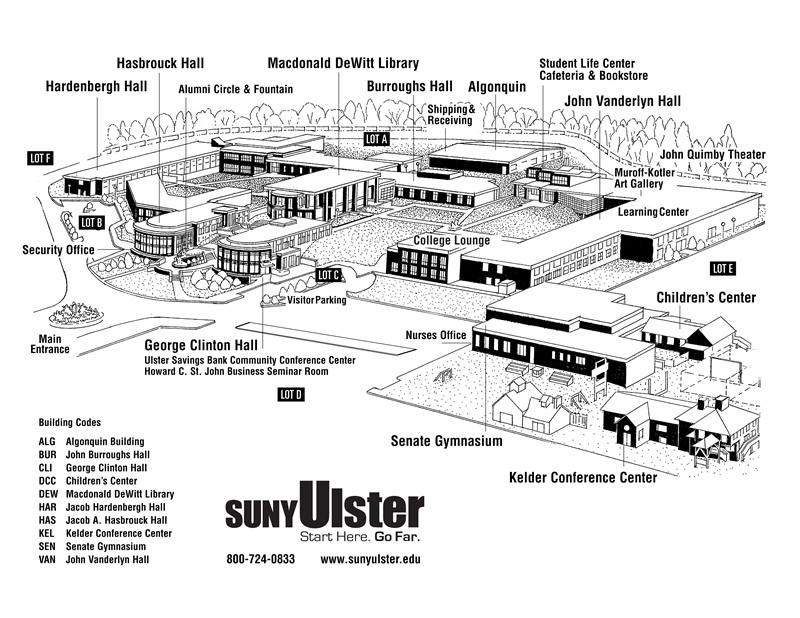 At the close of each semester, students’ grades are made available in the Portal at my.sunyulster.edu. Grades are issued at the end of each semester. The College uses an alphabetical system to describe the quality of the student’s work in each course. To determine a students’ academic standing for purposes of course progression, honors, graduation, probation, and dismissal, a quality point system is used. A Indicates highest achievement. It involves conspicuous excellence in several aspects of the work. B+ Indicates general achievement of a high order. It also involves excellence in some aspects of the work, such as the following: completeness and accuracy of knowledge, sustained and effective use of knowledge, independence of work, and originality. C+ Indicates the acceptable standard for graduation from SUNY Ulster. It involves such work as may fairly be expected of any SUNY Ulster student of normal ability, who gives to each course a reasonable amount of time, effort, and attention. Such acceptable attainment should include the following factors: familiarity with the content of the course; familiarity with the methods of study of the course; evidence of growth in actual use both of content and method; full participation in the work of the course; evidence of an open, active, and discriminating mind, and ability to express oneself in intelligible English. D+ Indicates degrees of unsatisfactory work, and is a below standard grade. It signifies work that in one or more respects falls below the minimum acceptable standard for graduation, but which is of sufficient quality and quantity to be counted in the units required for graduation (unless a department specifically requires a higher grade for a particular course). F Failure. May not be counted toward the degree. W Withdrawal. Grade issued when a student officially withdraws from a course during the first two-thirds of the time period of the course. Grades of W are not calculated in the grade-point average. 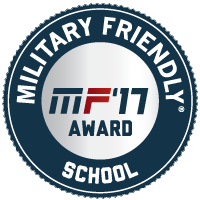 If a student withdraws during the last one-third of the course, the student may receive a grade of F. A W grade will be assigned with the approval of the Vice President for Academic Affairs for documented special circumstances such as a death in the family, hospitalization, prolonged illness or transfer from the area. Incomplete. This is a temporary grade issued at the discretion of the instructor when a student has completed all but final course requirements and for reasons beyond the control of the student is unable to complete all requirements by the end of the standard academic term. Requests for a grade of incomplete must be initiated by the student, and a contract specifying the conditions for completing the course must be signed by both the student and the faculty member by the last day of final examinations for the academic term. The deadline for completing the course will be specified by the professor in the contract, but will not exceed 30 calendar days into the succeeding academic term. The faculty member may choose to enter an alternative grade on the contact. If the faculty member enters an alternative grade and does not subsequently change that grade by the deadline, the alternative grade will become the final grade in the course. If the faculty member does not enter an alternative grade, and if a grade change has not been received by the deadline, the Incomplete grade will change to an “F” and be calculated into the Grade Point Average at that level. S Satisfactory. Grade used when the student successfully completes a course with the satisfactory/unsatisfactory option. The grade is not calculated in the student’s average; however, course credits can be used to meet graduation requirements. U Unsatisfactory. Grade used to indicate unsatisfactory performance in the satisfactory/unsatisfactory option. The grade is not calculated in the student’s average. During their entire stay at SUNY Ulster, a student may choose to take two elective courses, assigned or unassigned, outside a major area of study on a satisfactory/unsatisfactory basis while fulfilling curriculum requirements. A student must select this option and formally notify the Registrar’s Office within the first one-fifth of the course. In accordance with the established grading system, a satisfactory grade would range from A-D. This policy does not apply to those courses offered only on a satisfactory/unsatisfactory basis. AU Audit. Grade issued when a student has satisfactorily audited a course according to the instructor’s requirements. No credit is awarded for an audit grade, and the grade is not calculated in the student’s average. The course may not be used for graduation purposes and is not transferable. A student who audits will receive an audit notation on the transcript upon the direction of the instructor of the course. Auditors are encouraged to observe attendance regulations of the College and to participate in class to the extent deemed reasonable and necessary by the instructor in order to receive the audit notation. Grades followed by # are awarded in developmental courses, which carry no college credit. They are not calculated in the student’s average. Grades followed by > indicate that the courses were removed from calculation in the student’s grade point average under the Transcript Re-Evaluation or Fresh Start policies. Information about Transcript Reevaluation is available below, and information about Fresh Start is available in the Admissions section of this catalog. They have completed at least 12 semester hours of credit-bearing courses. They have a semester grade-point average of at least 3.75. They have a cumulative grade-point average of at least 3.3. They have no current semester grade lower than a C.
They have no I or F grades in the qualifying semester. They have a semester grade-point average of at least 3.3. They have a cumulative grade-point average of at least 2.0. They are registered as part-time students (fewer than 12 credits). They have no I grades in the qualifying semester. They have a semester grade-point average of 3.3. Part-time students are reviewed for eligibility as they accumulate units of 12 or more credits. Once reviewed, students must accumulate an additional 12 credits to be eligible for the next review. Students who register as full-time students but drop to part-time status after the census date are not eligible for the part-time President’s and Dean’s Lists. A matriculated student who fails to maintain a satisfactory GPA is subject to academic probation or dismissal. Academic probation, including any accompanying restraints upon the student’s activities, is intended to encourage greater effort by the student who appears to be having difficulty meeting academic standards. Probation lists are compiled at the end of each term and applied to the student’s academic standing for the following semester(s). A student on probation who does not achieve the minimum acceptable GPA by the end of the next semester may be subject to dismissal review by the Academic Review Committee. The progress of part-time matriculated students will be reviewed in units of six or more credits. A part-time student placed on probation for two consecutive terms may be subject to dismissal review by the Academic Review Committee. Academic dismissal means that the student has lost matriculated status at the College and cannot return to the college or take classes for at least one academic term (Fall or Spring). A student who has been dismissed and who believes that an error has been made or extenuating circumstances exist has the right of appeal. A student who is currently enrolled will be permitted to continue attending classes until a decision is made on the appeal. Students petitioning for reinstatement or appealing a dismissal decision must meet all submission deadlines which are communicated to the student at the time of dismissal. During each semester a student is on academic probation, the student will be limited to enrolling in 12 credits or 4 courses required in their degree program. The student will also be restricted from holding a club or Student Government office, from assuming the editorship of a College publication, and from participating in intercollegiate athletics until such time as the student is removed from probationary status. Further credit restrictions may be imposed by the Academic Review Committee. Students determined by the College to be eligible for graduation shall be awarded the appropriate degree, certificate, or diploma for their program. Submit an application for Graduation by the deadline. Applications are available on the Portal and from the Registrar’s Office. Have a cumulative grade-point average for all courses of at least 2.0. There may be additional, specific requirements for particular programs. Successfully complete all the requirements as stated in the catalog for the year the student was matriculated in or those in place at the time a change of major was recorded. Any change in meeting these requirements must be approved by the Vice President for Academic Affairs prior to registration for the semester in which the student expects to receive the degree, certificate, or diploma. 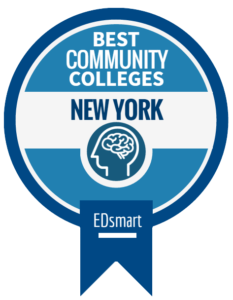 Satisfy the College’s residency requirement: at least 30 hours of successfully completed credits taken at SUNY Ulster for a degree, 15 hours for a diploma, and at least half of the total required credits for a certificate program. Satisfy the College’s General Education requirements. Information about these requirements is available in the General Education and Electives section of this catalog. Students need the recommendation of a faculty advisor for all waivers and substitution of courses from prescribed curricula. After the advisor has recommended the change, it must go to the appropriate department chair and then to the Vice President for Academic Affairs for final approval. This should be done before students register for the semester in which they plan to be graduated. To be graduated with High Honors, students must have a cumulative grade point average of 3.75 or higher. A notation of “W High Honors” will then appear on the student’s transcript. To be graduated with Honors, students must have a cumulative grade point average between 3.3 and 3.74. A notation of “W Honors” will then appear on the student’s transcript. The SUNY Ulster Board of Trustees approves the awarding of posthumous degrees and the giving of posthumous certificates of recognition at the College. Posthumous degrees and certificates of recognition will typically be bestowed at the college’s May commencement exercises. A posthumous degree is awarded when a deceased student was nearing completion of degree requirements and meets the criteria outlined in the procedure. If a deceased student does not qualify for the award of a posthumous degree, the student may be given formal recognition for studying at the college. A posthumous certificate of recognition may be given if the criteria also outlined in the procedure are met. Candidates for posthumous degrees and posthumous certificates of recognition will be given to the Board of Trustees as part of the proposed candidates for graduation list submitted prior to commencement. When a currently enrolled student dies prior to completing requirements for a degree or meeting an academic goal at SUNY Ulster, that student may be recognized posthumously for the work completed at the college and as a gesture of compassion to the student’s family. There are two types of posthumous recognition, the posthumous degree and the posthumous certificate of recognition. The student has completed 75 percent or more of the required courses for an academic program or would have met 75% of the required courses upon completion of the enrolled semester. The student was enrolled in classes at SUNY Ulster at the time of death. Requests should be made within two years. The student was meeting at least acceptable achievement standards as defined by the College’s Academic Standards and Progress policy in the College catalog and in good financial standing with the College. The student has attempted at least 12 credits at the college. The student has enrolled in classes at SUNY Ulster at the time of death. Requests should be made within two years. 1. An interruption by injury, illness, deployment, etc., in the student’s continuous enrollment. 2. Serving in the armed forces. A member of the college’s faculty or staff or family member of the deceased may request consideration for a posthumous degree or posthumous certificate of recognition. This request should be made to the Registrar, where it will be evaluated to confirm that the request meets the criteria. After evaluation by the Registrar, the request will be presented to the Vice President of Academic Affairs for consideration. A request approved by the Vice President of Academic Affairs will be presented to the college’s Board of Trustees for approval. 1. Posts the notice of the award of the posthumous degree of certificate to the student’s transcript and orders a diploma. The statement “awarded posthumously” will be printed on the student’s transcript, but not on the diploma. 2. May confer a degree or certificate with no posthumous designation on the transcript if the student who is deceased had applied for graduation and had completed all program requirements. Requests for official transcripts to be sent to other agencies or schools must be made in writing by the student. Transcript request forms are available in the Registrar’s Office, on the Portal or on the College’s website here. The request should include the student’s name, current address, phone number, date of last attendance, any name change, student’s ID or social security number, and the name and address where the transcript is to be sent. No transcripts will be sent for students who have outstanding debts to the College (financial obligations, library books, traffic violations, equipment, etc.) until these obligations have been met with the appropriate office. Until that time, requests will be returned and the student must submit a new transcript request when the hold is released. There is a nominal per official transcript request. Payment must be submitted at the time of the request by credit card, personal check, or money order if requesting the transcript via mail; by cash, credit card, personal check, or money order if requesting the transcript in person, or by credit card if requesting the transcript via fax;. Requests are processed approximately two weeks after grades are submitted. Students who have completed their academic requirements, but who have outstanding financial or other obligations to the College, will be graduated. The diploma, however, will be held and no transcript or certification of graduation will be released until financial or other obligations are met. Students can access final grades and their entire academic record on my.sunyulster.edu, as long as there are no outstanding debts to the College. Students who change their legal or mailing address should notify the Registrar’s Office immediately so that records may be corrected in conformity with the law. Students must present a picture ID in order to request any change to their student record. If a matriculated student wishes to change a major area of study, the student must complete a Change of Curriculum form. A formal change of program requires the signature of the student’s academic advisor Forms are available at the Registrar’s Office and on the Portal. 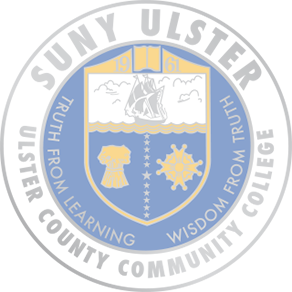 Students are bound by the program and degree requirements as stated in the catalog for the academic year in place at the time of a change in curriculum. A student who changes programs within the College may desire a modification of the academic record to delete non-applicable grades from the academic average. Students selecting this option must utilize the credits and grade-point average of all courses required in the previous program, that are also applicable to the new program, as determined by the coordinator or chairperson of the new program. The student may also request to utilize toward the new program, the credit and grade-point average of any courses fulfilling the previous program’s unspecified elective requirements, as determined by an advisor. Changes involving modification of transcripts must receive final approval of the Vice President for Academic Affairs. The grade-point average of those courses applicable to the new curriculum will be calculated in the student’s cumulative average at the end of the first semester (spring or fall) in the new program. This re-evaluation may occur only once during a student’s studies at SUNY Ulster. A student is generally not permitted to take a course if the student has successfully completed a higher-level course in the same discipline. Full-time and part-time students will be allowed to make changes to their schedules during the first four days of full semester fall and spring classes. Add/Drop periods are significantly shorter during summer and Winternet sessions and accelerated courses. The Add/Drop dates are available on the academic calendar here. Students must obtain an Add/Drop form from the Registrar’s Office. Changes in which a different course is selected, not just a different section of the same course, must have the approval of the student’s advisor. There is an end-of-semester culminating experience in each course. This may take the form of a final examination; a unit examination; a term project; or a final evaluation of projects, papers, or performances completed by students. Within the first two weeks of classes, the individual instructor will inform students of the method to be used. At the end of the semester, all students taking ENG 081 and ENG101 must take a timed departmental writing competency test, which a panel of instructors evaluates. The results of this exam constitute 25% of the student’s grade for the course. Students who have earned a C or better in the course after the exam grade is incorporated into the final course grade may register for the next sequential course. When a course is repeated, only the last grade (A-F) will count in the grade-point average, even if the last grade is lower than the grade(s) received on the previous attempt(s). No repeated courses or their grades will be removed from the student’s transcript. Repeating a course may affect a student’s financial aid status. This policy does not apply to courses which, because of their varied content, have been designated as courses that may be repeated for credit. To be eligible for graduation, a student must have successfully completed at least 30 credits for a degree, 15 hours for a diploma, and at least half of the total required credits for a certificate program. To earn a second degree at SUNY Ulster, a student must successfully complete a minimum of 15 credits, in residence, beyond those earned for the first degree. These 15 credits must be in a different field of study and must, when combined with the other credits, fulfill the requirements of the second degree. Intermediate Studies courses may not be included in the 15 credit-bearing residency requirement. Students wishing to withdraw from a course must secure the necessary withdrawal form from the Registrar’s Office. The withdrawal must be processed promptly by the student by immediately notifying their advisor, and the Registrar’s Office. The instructor is notified via an automated email when the withdrawal code is entered into the student’s record. A student may officially withdraw from a course through the first two thirds of the time period of that course and will receive a grade of W. Withdrawal deadlines are available here. Withdrawal from classes early in the semester may entitle the student to a partial refund. Information about withdrawal and refund policy is available here. A student may withdraw during the last third of the course only for verified special circumstances, such as death in the family, hospitalization, transfer from area, or prolonged illness. In these cases, information must be submitted by the instructor through the office of the Vice President for Academic Affairs, on a form available in the Registrar’s or Vice President’s Offices. Supporting documentation must accompany special circumstances withdrawals. Withdrawal can impact financial aid eligibility. Students receiving financial aid should consult the Financial Aid Office to understand their individual circumstance. Information about withdrawal and financial aid is here. Full-time students wishing to withdraw from the College must secure the necessary withdrawal form from the Office of the Assistant Dean of Student Services. These forms must be signed by the advisor, a representative of the Student Accounts Office, Financial Aid, the Library, and the Enrollment and Success Center. Failure to withdraw properly may lead to grade problems for the student. SUNY Ulster students in good academic standing who voluntarily withdraw from all courses prior to the end of an academic term, or who intend to disrupt continuous enrollment at the College for one calendar year or less, are eligible to take a Leave of Absence. The Leave, which may be for a maximum of one calendar year, allows the student to maintain matriculation during the period of non-attendance. When the student returns to College, he/she is eligible to register for courses and remains subject to the Catalog and policies and procedures in place at the time of initial matriculation. In extraordinary circumstances, students may request an extension of the initial Leave of Absence for a period not to exceed one additional calendar year. Students who do not request a Leave of Absence, and who have a gap of more than one academic term (Fall or Spring), will be required to reapply for admission to the College, and will be subject to the Catalog, policies and procedures in place at the time of readmission. Readmitted students who were in competitive, selective programs such as Nursing or Veterinary Technology, will have to reapply to those programs, as well. Readmission to the College does not guarantee re-admission to specific programs. Students wishing to take a Leave of Absence should contact the Assistant Dean for Student Services. The Semester / Credit Hour Policy and Compliance defines the college’s policy on the assignment of semester / credit hours and the method by which the college’s compliance with credit hour assignment is assured. All credit-bearing degree and certificate programs at SUNY Ulster are approved by the New York State Education Department (NYSED). Calculation of credit hours for these programs follows NYSED guidelines, which are consistent with the U.S. Department of Education’s definition of a credit hour. Click here to access and read the entire Semester/Credit Hour Policy & Compliance document.